How Accurate and Flexible Is Waterjet Cutting? | Antech Technologies Inc.
Antech Technologies Inc. / News / How Accurate and Flexible Is Waterjet Cutting? A waterjet cutter is an industrial tool used to cut a wide variety of materials by making use of a high-pressure jet of water – 30,000–90,000 psi – or, depending on the material, like metals or granite, a mixture of water and an abrasive substance. Most often, but not exclusively used during the fabrication process of various machine parts, waterjet cutting is a preferred method when working with high-temperature sensitive materials that may otherwise be damaged or distorted during one such process. There are other benefits to waterjet cutting, providing users with both accuracy and flexibility, among other things. By its very nature, waterjet cutting is a relatively cheap alternative to other types of cutting methods. Since it’s a cold-cutting process, the likelihood of heat damage such as distortion, warping, or material hardening is wholly eliminated, meaning that there is rarely a need for secondary processing. The method is also safer for operators and the environment as it doesn’t require any chemicals or heat to achieve the desired result. It will only use water or a water-abrasive substance mixture, which will not produce any dangerous fumes or vapour. Any ejected dust particles will be trapped in the water and will be safely filtrated and eliminated without ever being released into the air. 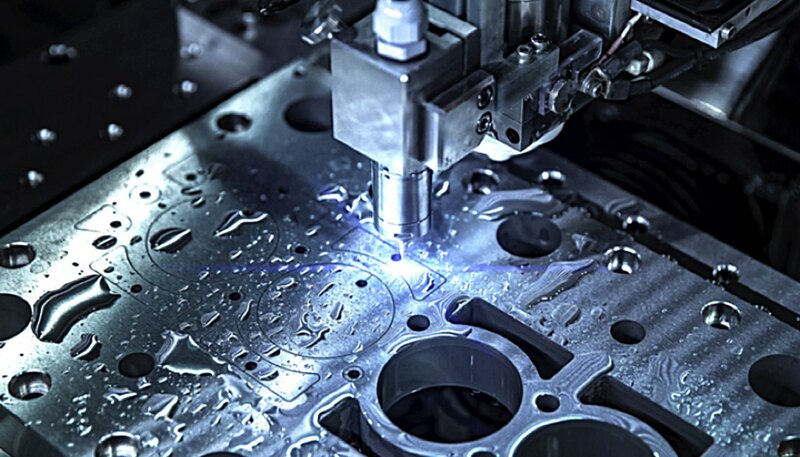 Aside from the low initial running costs compared to other cutting techniques, as well as a much smaller risk of damage or accident, waterjet cutting also provides other cost-saving benefits concerning cutting and setup speed, often eliminating the need for clamping, altogether. The technique can cut almost any material without altering their properties. Waterjet cutting is relatively inexpensive and quickly finds its way in nearly every industry. The fact that the cutting stream can also be easily changed at will also increases the versatility of this method. The most common materials subjected to this cutting procedure can be up to 7″ thick and include things like plastics, textiles, rubber, composites, stone, glass, tile, metals, paper, leather, foam, and many others. Metals, ceramics, and other harder materials can be cut with an abrasive waterjet, as long as it is softer than the abrasive substance being used. Among the few elements that cannot be waterjet-cut are diamonds and tempered glass. Waterjet cutting accuracy significantly was enhanced with the introduction of motion control systems during the 1990s. The technique’s cutting accuracy is dependent on the possibility to change the nozzle speed when working on corners and details. By utilizing a computerized controller, operators can position the nozzle with pinpoint accuracy while also specifying the exact speed at every point along the cutting path. When it comes to thinner materials – no more than 1″ in thickness – a smaller than 0.005″ tolerance is possible. And since the cutting speed can be changed mid-cut, multiple edges are also achievable. As far as limitations are concerned, however, the inside corners cannot be perfectly sharp because of the Kerf width that matches the jet’s thickness. Though insignificant in most situations, it should always be taken into consideration when designing a new part. Likewise, waterjet cutting is a tool primarily used for cutting all the way through a material. It is seldom used for engraving or cutting of a certain depth. Waterjet cutting is an extremely efficient and cheap way of creating complex shapes or components. At Antech Technologies, we can develop panels, parts, letters, and artistic projects in whatever size or font. Be it aluminum, brass, stainless, composite, copper, stone, glass, ceramic, or any other material; there will be no problem for our waterjet cutting services. For more information, do not hesitate to contact us directly.